You are going to Watch Naruto Shippuden Episode 275 English subbed online free episodes with HQ / high quality. Stream Anime Naruto Shippuden Episode 275 Online English sub A Message from the Heart. Naruto leaves his training hall but being blocked by shinobi guards. Aburame Shibi insists Naruto to go back but Iruka arrives and attempts to fool Naruto. However, Naruto didn’t believe on Iruka and using his Sage Mode he manages to leave the cave. Naruto was restrained via a shadow jutsu and Iruka continues to convince Naruto. Iruka gives Naruto’s headband which he is about to restrain Naruto, but Naruto overpowers the group and leaves. 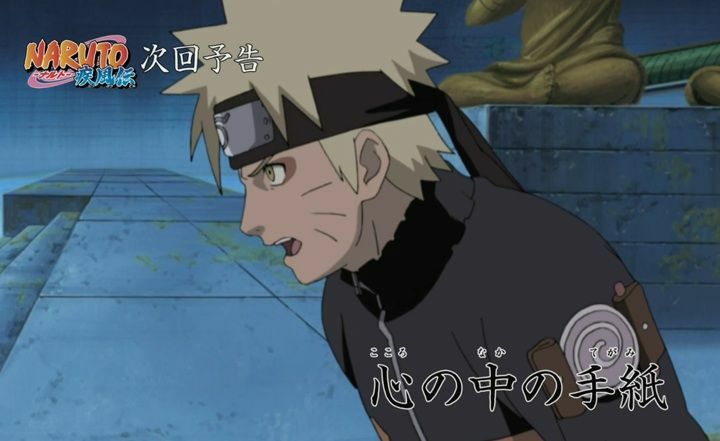 On his headband, Naruto reads the letter from Iruka telling that he should come back alive.